Last night Stuart and I went to see the latest show from the Kenneth Branagh Theatre Company - a Terence Rattigan double bill of the rarely performed comedy Harlequinade and one-woman piece All On Her Own at the Garrick Theatre in London's glitzy West End. First up was All On Her Own starring Zoe Wanamaker as a widow alone at midnight in her house at London. It is both heart-breaking and sinister and gives a chance for Ms Wanamaker to really pull out all of her acting stops. She drinks, she screams, she rolls around on the floor. Great stuff. This film dove-tailed nicely into the second play of the night, Harlequinade. 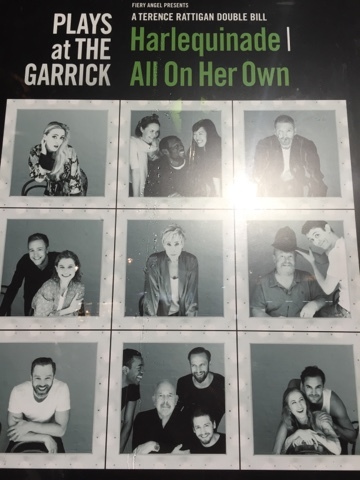 Post-modern and self-referential, Harlequinade has many of the principal players from the Kenneth Branagh Theatre Company other concurrent 'proper' production The Winter's Tale (which we saw last week.) The plot is an idiotic farce that is itself satirical of idiotic farces, the new movement of 'theatre with a conscience' and the Bard. In fact it is this last target that makes up the main plot. A professional theatre company encouraged by CEMA is presenting Shakespeare’s Romeo and Juliet in Brackley in the Midlands and we see the action of the last dress rehearsal with the players dropping in and out of character. The underlying plot is that of Shakespeare’s The Winter's Tale with babies, long lost daughters and mismatched lovers all turning up on stage - each played by the very same actors who played the analogous roles in the 'proper' production of The Winter's Tale that the Kenneth Branagh Theatre Company is also staging. So as you can imagine - double and treble layered humour abounded. It's all very funny with Zoe Wanamaker (yes, her again) taking all the funniest lines as Aunt Maud. If you are going to see their The Winter's Tale this is a lovely companion piece.